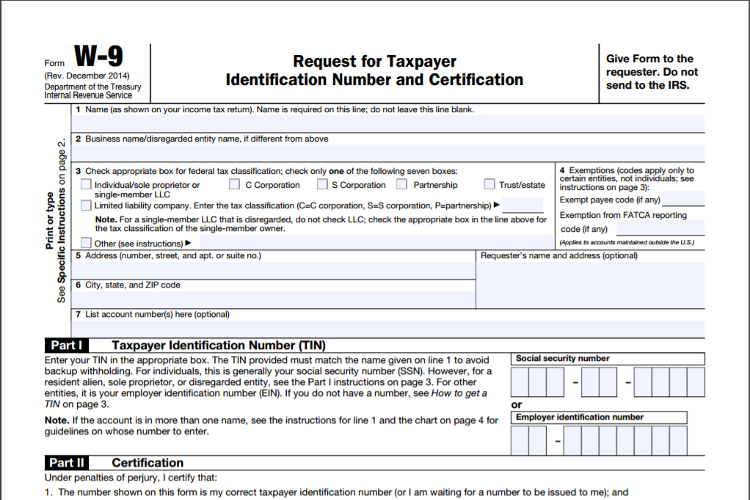 Like all IRS forms, filling out a W-9 form is not very interesting. But W-9 forms are a very necessary part of hiring contractors, so we’ll try to make it as painless as possible. So, you may have heard of a W-4. W-4 forms essentially for hiring full-time employees. They verify the identity of potential W-2 employees. So that means that you’re going to dictate when and where these employees work, what they work on, and how much in taxes to withhold for them. W9 is for an independent contractor rather than a full-time employee. So rather than being told when and where you need to work, you are given a goal of what you want to accomplish. You will get 1099 at the end of the year, so this W-9 is basically just a way to verify up front. So let’s walk through real quick how-to on filling out a w9 form. Don’t worry, it’s not that hard. You don’t need to feel that intimidated. You can start filling out W-9 form on the IRS website. LLCs have their own separate tax indices, so if you’re not being taxed as a sole proprietor then you need to put down your federal employee identification number and not your social security number on the W-9. So keep that in mind. If the LLC belongs to another LLC then you would want to check the LLC company box. You’d also want to indicate the tax classification of the parent LLC. If your LLC belongs to a single member, then you want to also include the tax classification of the owner or the member. If the LLC is composed of a single member who is a person, then just put the individual’s name. Then put their social security number instead of the LLC’s federal employer identification number. You have to tell the IRS whether or not you are subject to mandatory backup holding. This is basically because they don’t want you to get around getting paid as a 1099 employee and hindering their ability to withhold some of that to pay your tax debts. So, how do you know if you are subject to it or not? There are two common reasons why you might be subject to backup withholding. The first is if your name and social security number don’t match IRS record.The second is if you have a tax lean and the IRS lets you know that you are going to, but you are subject mandatory backup withholdings. The W-9 form is pretty short, so it’s probably pretty straightforward. But let’s go over some quick questions that might come up. How often should I update my W-9? You should update your w9 whenever your information changes. For example, if your name changes because you got married or if you changed the corporate structure of your business so that the EIN or the business name’s going to be different—anything like that. I received a W-9 from someone who’s not going to be paying me to do work for them. Do I still have to fill it out? You may actually get a W-9 in some situations that you don’t expect, but you don’t have to fill out a W-9 just because you get one. The W-9 is just used to officially ask a person or business for some information. They ask you for your name, address, taxpayer information so that they can issue tax documents to the IRS. But if they’re not paying you, you don’t have to fill it out.